If you’ve grown tired of the appearance of your fireplace, or perhaps you recently moved into a home in which you want to change the look of the existing fireplace, creating a few façade using stacked natural stone is a project you can try at home. And what better way to express your environmental side than to use remnant granite pieces for the project—pieces that would have otherwise headed for the landfill. The project should take about eight hours at a cost of just over $300. The first step is to purchase granite pieces from a local stone recycler, or fabricator. Request granite tile pieces measuring about one inch high. Tell the vendor the dimensions of your fireplace and that you are cladding a fireplace with the recycled granite to achieve a stacked stone look. You will want the pieces to have a color mix of some kind. Next, frame the fireplace with cement board. Be sure the screws do not compromise the fireplace in any way. 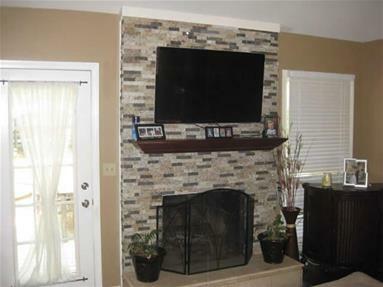 If unsure, call a Stone and Tile PRO. Mix your thinset mortar per instructions and add to the back of the each piece of granite, taking into account that these scraps are imperfect so the mortar must conform to the shape of each piece. Start placing the one-inch tiles from the wall outward to the corner. Then cut your next piece to size and continue with the first row all the way around the fireplace. Work your way toward the ceiling, row by row. Marking a horizontal chalk line will help to keep the cladding level. Step back at times to be sure you are mixing the color variations in a random, but aesthetically pleasing style. It’s important to stagger the seams, as you would a hardwood floor. Recycled granite pieces are not perfect, so some areas may need tile wedge shims inserted if a piece appears crooked. Remove shims when mortar is dry. Vacuum the stone to clear away any dust that may be left on the stones. As a recycled granite expert, I have created a number of these makeovers. The installation is fairly easy and the imperfections from using recycled granite pieces create an original look for your home. Julie Rizzo is president and founder of Recycled Granite, based in Highland, Indiana.